More often than not, when you build applications to be consumed by others, you will need to represent the data in some sort of table or list. Think of a list of users for example, or a table filled with data about the soccer league. Now, imagine the data that populated the table was to be reordered or altered, it would be nice if everyone viewing the data on the table sees the changes made instantaneously. 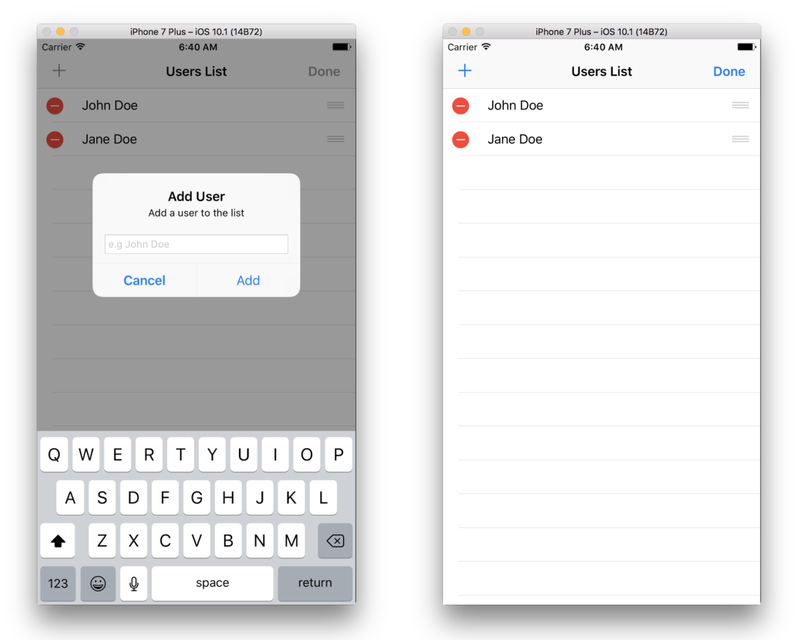 In this article, you will see how you can use iOS and Pusher to create a table that is updated across all your devices in realtime. You can see a screen recording of how the application works below. In the recording above, you can see how the changes made to the table on the one device gets mirrored instantly to the other device. Let us consider how to make this using Pusher and Swift. Once you have you have all the following then let us continue in the article. Launch Xcode and create a new project. Follow the new application wizard and create a new Single-page application. Once the project has been created, close Xcode and launch the terminal. In the terminal window, cd to the root of the app directory and run the command pod init. This will generate a Podfile. Save the Podfile and then run the command: pod install on your terminal window. Running this command will install all the third-party packages we need to build our realtime app. 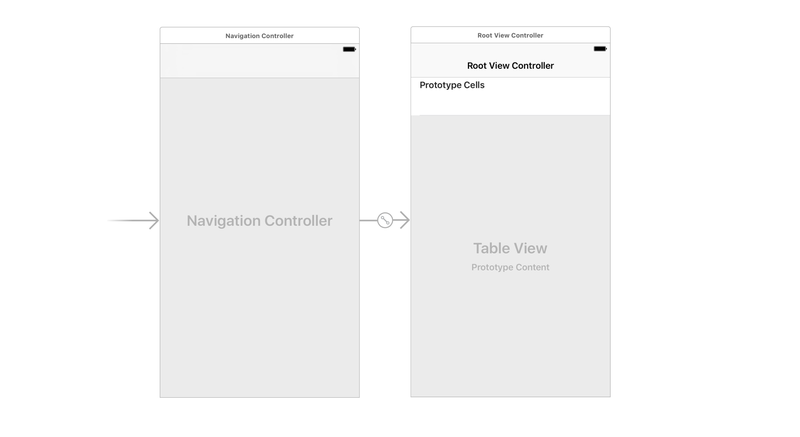 Once Xcode has finished loading, we can now start building our interface. 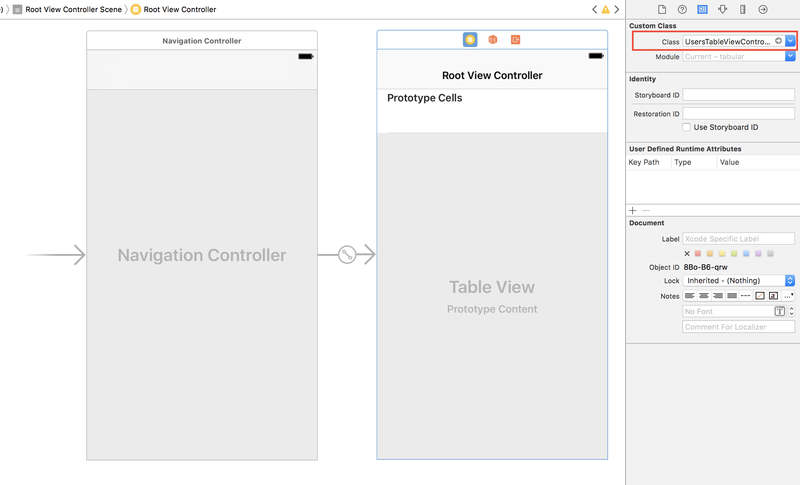 As seen in the screenshot, we have a simple navigation controller and we have made the table view controller attached to it our Root View Controller. Now we need to add a reuse identifier to our table cells. Click on the prototype cell and add a new reuse identifier. Great! Now we are done with the user interface of the application, let us start creating the logic that will populate and make our iOS table realtime. The first thing we want to do is populate our table with some mock data. Once we do this, we can then add and test all the possible manipulations we want the table to have such as moving rows around, deleting rows and adding new rows to the table. cell.textLabel?.text = users[indexPath.row]["name"] as! String? The above code has 5 functions. The first function tells the table how many sections our table has. The next function tells the table how many users (or rows) the table has. The third function is called every time a row is created and is responsible for populating the cell with data. The fourth and fifth function are callbacks that are called when data is moved or deleted respectively. Now, if you run your application, you should see the mock data displayed. However, we cannot see the add or edit button. So let us add that functionality. In the code above, we have added two buttons, the left, and right button. The left being the add button and the right being the edit button. self.textField.placeholder = "e.g John Doe"
The code simply creates an alert when the add button is clicked. The alert has a textField which will take the name of the user you want to add and append it to the users property. Now, we have a working prototype that is not connected to any API. If you run your application at this point, you will be able to see all the functions and they will work, but won’t be persisted since it is hardcoded. Great, but now we need to add a data source. To do this, we will need to create a Node.js backend and then our application will be able to call this to retrieve data. Also, when the data is modified by reordering or deleting, the request is sent to the backend and the changes are stored there. Now, let us start by retrieving the data from a remote source that we have not created yet (we will create this later in the article). The method above uses Alamofire to make calls to a self.endpoint and then stores the response to self.users. It also calls an indicator.startAnimating(), this is supposed to show an indicator that data is loading. That’s all! Now, let’s create the loading indicator that is already being called in the loadUsersFromApi function above. 💡 The endpoint would need to be changed to the URL of your web server when you are developing for a live environment. The function above will simply set up our UIActivityIndicatorView, which is just a spinner that indicates that our data is loading. After setting up the loading view, we then add it to the table view. 💡 We set the hidesWhenStopped property to true, this means that every time we stop the indicator using stopAnimating the indicator will automatically hide. Adding this before calling the loadUsersFromApi call will ensure the indicator has been created before it is referenced in the load users function call. Now, let’s hook the “Add” button to our backend so that when the user is added using the textfield, a request is sent to the endpoint. 💡 We are adding the device ID so we can differentiate who made what call to the backend and avoid manipulating the data multiple times if it was the same device that sent the request. When we integrate Pusher, the listener will be doing the same manipulations to the user property. However, if it’s the same device that made the request then it should skip updating the property. The next thing is adding the remote move functionality. Let’s hook that up to communicate with the endpoint. In the code above, we set the payload to send to the endpoint and send it using Alamofire. Then, if we receive a successful response from the API, we make changes to the user property. Just like the others, we have just sent the payload we generated to the API and then, if there is a successful response, we delete the row from the users property. Now, the next thing would be to create the backend API. However, before we do that, let us add the realtime functionality into the app using Pusher. Now that we are done with hooking up the API, we need to add some realtime functionality so that any other devices will pick up the changes instantly without having to reload the table manually. In this block of code, we have done quite a lot. First, we instantiate Pusher with our application’s key and cluster (replace with the details provided to you on your Pusher application dashboard). Next, we subscribed to the channel userslist. We will listen for events on this channel. In the first channel.bind block, we bind to the addUser event and then when an event is picked up, the callback runs. In the callback, we check for the device ID and, if it is not a match, we append the new user to the local user property. It does the same for the next two blocks of channel.bind. However, in the others, it removes and moves the position respectively. The last part is pusher.connect which does exactly what it says. That is all! We have created a realtime table that is responsive to changes received when the data is manipulated. The last part is creating the backend that will be used to save the data and to trigger Pusher events. This file will contain all the packages we intend to use to build our backend application. This will be the location of all your configuration values. Fill in the values using the data from your Pusher application’s dashboard. Next, create an empty database.sqlite file in the root of your web app directory. In the above, we declare the migrations to run when the application is started. 💡 The -- Up marks the migrations that should be run and the -- Down is the rollback of the migration if you want to step back and undo the migration. In the code above, we loaded all the required packages including Express and Pusher. After instantiating them, we create the routes we need. The routes are designed to do pretty basic things such as adding a row to the database, deleting a row from the database and updating rows in the database. For the database, we are using the SQLite NPM package. In the last block, we migrate the database using the /migrations/001-initial-schema.sql file into the database.sqlite file. Then we start the express application after everything is done. When the installation is complete and the application is ready you should see the message App listening on port 4000! 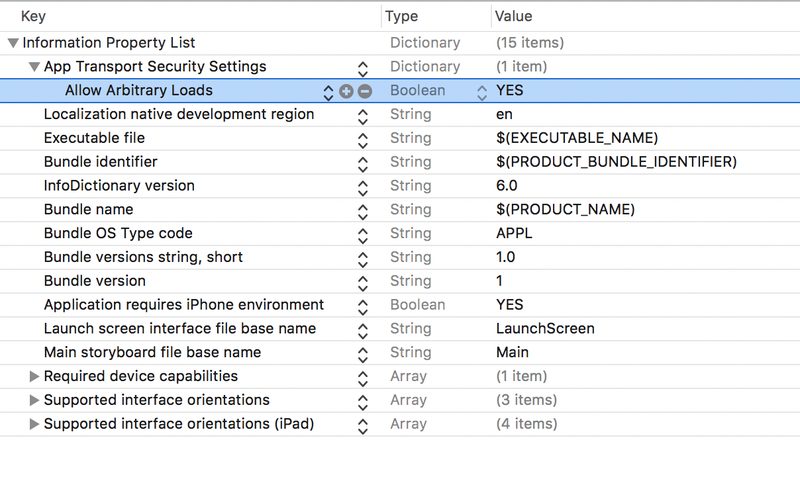 This article has demonstrated how you can create tables in iOS that respond in realtime to changes made on other devices. This is very useful and can be applied to data that has to be updated dynamically and instantly across all devices.